Whether you check your portfolio more than once a day or you just do quarterly adjustments, you need a stock market app that quickly shows your investments. 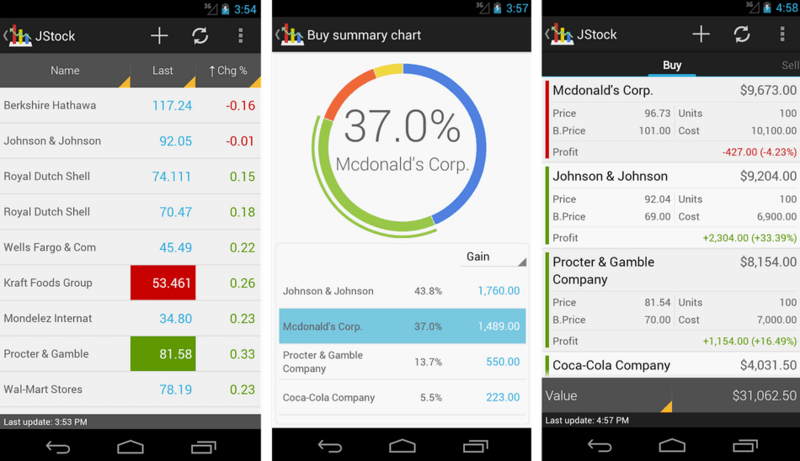 Gone are the days of dull charts and line graphs; these apps are colorful and offer real-time market and economic news and information, as well as powerful tools for analysis. JStock's description in the Google Play app store says that the free version offers two technical analysis tools that show EMA and SMA, but I couldn't find them in the app. You will see some ads in the news feed in the free version. Cloud storage integration with JStock desktop software for Windows, Mac, and Linux. Dividend chart, portfolio summary chart, and zoomable history chart. Unlimited watchlists, portfolios, and stocks news. Display foreign stock portfolio value in local currency based on exchange rate. There is a seven-day free trial for the premium version. The app lets you build easily customizable watch lists, and tilting the screen to a landscape format allows for in-depth graphs that compete with some of the best desktop software out there. The interface is clean, the app is free (there are ads), and the economic calendar option is incredibly useful to stay ahead of macro events and earnings reports. TD Ameritrade, a major US brokerage, released thinkorswim as a way for options traders to keep track of their position from their mobile devices. Since then, the app and its accompanying desktop platform have elevated thinkorswim to the top level of trading apps. Tickers are easy to read and traders who play options will love the ease of placing and tracking orders. You need to register for the app, and it will only become available when linked to a TD Ameritrade account, but the software is powerful once log in. There is a 60-day free trial period to decide if you like to app and ticker functions enough to place money into the brokerage. Stock Quote gives you a good overall look at the Dow Industrial Average, NASDAQ and S&P 500, and you can add other U.S. and international indices to track. The app serves up financial news from a variety of sources and includes both economic and earnings calendars. Enter a stock symbol to get real-time quotes both when the market is open and during pre-market and after-hours trading sessions. The app also tracks futures and currencies. Track individual stocks by adding them to the portfolio, and turn on auto-refresh to watch near real-time fluctuations in price and volume. Stock charts have a lot of options, like comparisons to other stocks or indices, technical indicators like RSI or MACD and more. You can set up a password to protect your portfolio information. You may also sync with a Dropbox account to back up your data. Add the stocks you hold or that you want to watch into Portfolio Watcher to get quotes. Tap on a stock to see charts, news and full information, including the day's high and low, P/E, EPS estimates, bid size, short ratio, one-year price target and much more. If you already have a portfolio set up on Google or Yahoo, it can be synced with Portfolio Watcher. Tap the News tab to get stock news from Reuters, CNBC, Business Insider, and other sources. Notifications can be set up for stock so your phone alerts you to price changes, or when the RSI, ROC or Slow Stochastic technical indicators go above or below a set point. There's much more to this app, and the developer takes feedback from users for future improvements to the app. There's simple support for Bitcoin and Google Drive backup.